PIGEON FORGE, TN – Dolly Parton’s Imagination Library has long been using social networks to create an audience for means of spreading awareness, but they have never had a viewership like this. The Imagination Library, chosen by Google for Nonprofits as a feature charity for December, is gaining extra attention on blogs and the new social network, Google+ pages for Nonprofits. As part of their #CauseILoveEm campaign, Google is encouraging users to share their favorite charity with others and get involved with the cause on Google+ pages for Nonprofits. Looking at the month in terms of big picture exposure Timmons says, “We should easily get added to several thousand new Google+ circles during the campaign but the real success is that now we’ve also been on Google’s Blog, which has over 500,000 readers.” Even greater than that, the Library is generating buzz throughout the Google world – an estimated audience of 1 billion visitors per month! 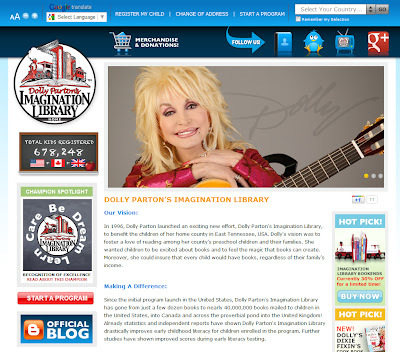 Within the social network, the page for Dolly Parton’s Imagination Library has become a place for users to gather information, share successes, and even “hangout”. Each day, the Library presents an inspiring story from their “Imagination Moments” series – giving a personal glimpse into the lives of families positively influenced by books from the Imagination Library. Viewers can vote on their favorite story rewarding the winner’s local library with a $500 donation from Timmons’s S.D. Professionals, LLC. The Imagination Library sends one book each month to a registered child until the month of their 5th birthday. The program, which began in Parton’s hometown of Sevierville, TN in 1996, has now given nearly 40,000,000 books to children spanning the United States, United Kingdom and Canada. PIGEON FORGE, TN – We here at Dolly Parton’s Imagination Library is excited to announce the launch of our brand new website. Recent additions have improved our registration process, spotlight affiliate successes, and enabled sharing of Imagination Library news across social networks with just one click. Due to a growing number of requests to replicate Dolly Parton's the Imagination Library program in new communities, the “Start A Program” form was introduced to help get the process rolling. From there, view informational videos, download helpful documents and presentations built to help with each step of the replication process. For example, potential new champions are automatically assigned a Regional Director to help them each step of the way. 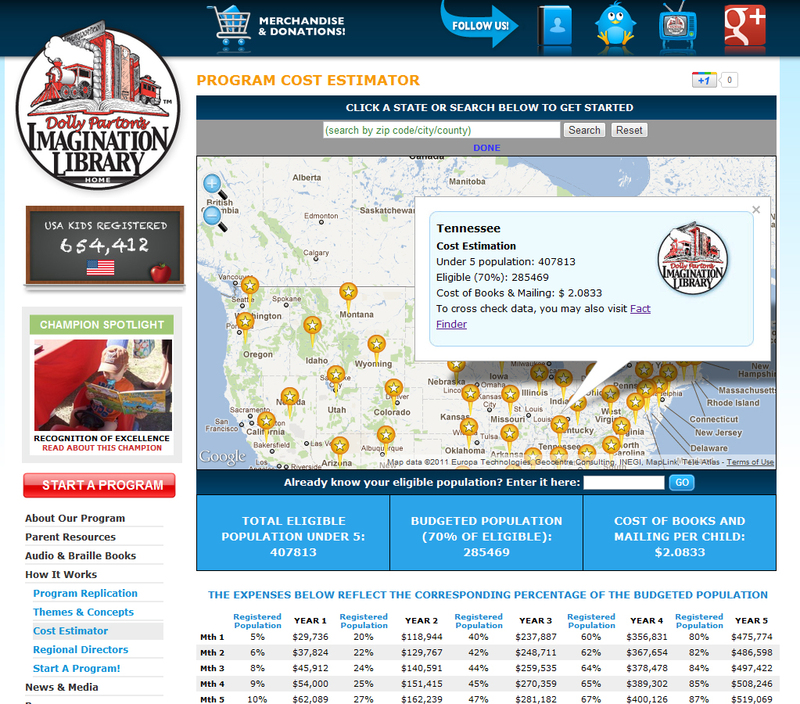 In addition, the state of the art “Cost Estimator Tool” combines census data, custom Google Maps, and an algorithm that instantly calculates the estimated cost of program launch with a 5-year projected cost based on program growth. Starting a program has never been this easy! The online registration rates for the Imagination Library doubled in 2011 alone! With such a large number, a new and improved online registration system has been designed to increase that amount once again for 2012. To do that, we have cut registration time in half and implemented more user friendly means of producing more accurate data. Now, before parents submit their child’s information, the system checks for: duplicate information, eligibility, and a verified address to ensure book delivery. To make it even better, we will be rolling this feature out for Canada and the United Kingdom very soon! A brand new Champion Spotlight was created to bring attention to those working hard for their community. 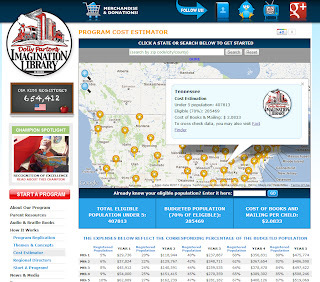 In this section, visitors can read of successes, find contact information, use an interactive map, and meet the Regional Director for their area. A “Chalkboard Ticker” has been installed on the site’s homepage so that viewers can be updated in real-time to know how many children are registered in each country. Users can also get rid of any language barrier with a Google Translate feature that translates nearly any language to another. Finally, a Tool Bar has been added to the bottom of the page that makes following the Imagination Library’s social networks easy (the Tool Bar is still in BETA testing and currently available in the U.S. only). S.D. Professionals, the website designers and developers, have been Imagination Library partners for more than ten years. They began transforming the program in 2005 with the introduction of an online book ordering system. The new system allowed for the Imagination Library’s international expansion into Canada and the United Kingdom, as well as accommodating more than 700,000 book orders each month. To see the new site and browse around, visit imaginationlibrary.com. For more technical information regarding our new features, checkout SD Professionals blog. ACADIANA, LA – Rarely do Public Service Announcements do more than just find a way to engage a small number while masses of others scurry for a new activity. In a rare instance, the United Way of Acadiana one a National Literacy Award for it’s short film telling the story of a community struggling to overcome obstacles such as illiteracy. The film, released in 2010, worked with the Women’s Leadership Council of United Way and local agency BBR Creative to tell of the involvement of Dolly Parton’s Imagination Library in their community. The film is both informative and visually stunning. Demetrius Glover, Ph.D., serves as Community Impact Director for Education for the United Way of Acadiana, when asked what set this film apart from other entries he answered, “We believe the use of real people and real stories is what captures viewers and ultimately makes our videos so powerful.” The film is indeed powerful and lets the viewer look directly into the eyes of women and children that deal with these struggles daily. In 2009, the Women’s Leadership Council introduced Dolly Parton’s Imagination Library. A short time later, a study from the University of Louisiana-Lafayette revealed that approximately 45% of parents read to their child every day before participating in the program; that percentage has increased to 71% since the families’ participation in the program. When asked for the motivation behind this project, Glover very simply stated, “The children of Acadiana. If one child's life can be improved through participating in Dolly Parton’s Imagination Library we have been successful.” It is safe to say that more than one child has been positively influenced from the program, they now mail out books to over 2,700 registered children in their area covering four parishes. The United Way of Acadiana has made their award-winning film – and others including their 2011 follow-up – available to the public. All films are posted to the website for a period of time before being archived on their Vimeo channel for sharing and viewing. For links to this film, and others, follow their social media links and eNewsletters which can be found on their website at unitedwayofacadiana.org.